This extraordinary grouping is one of the most fascinating in the Rare Flags collection. The Marquis de Lafayette, famed general of the American Revolution and beloved protégé of George Washington, returned to America in 1824 for a final tour of the country he fought for and loved. For more than a year, from August 1824 to September 1825, Lafayette, accompanied by his son, George Washington Lafayette, traveled through all twenty-four states. His grand tour was one of the most significant events in early 19th century America. The generation of Americans who fought the American Revolution was aging, and their fading flame inspired nostalgia for the early, idealistic era of the birth of the American Republic. By 1824, heroes such as Thomas Jefferson and John Adams were growing old, and had but few years left before they too would pass away--Adams was 88 years old, and Jefferson was 81. Incredibly, both would die on the very same day, July 4, 1826, less than a year after Lafayette's tour ended and he returned to France. Invited to America by his friend, President James Monroe, Lafayette visited Monroe at the White House. He visited Thomas Jefferson, James Madison and Dolly Madison at Jefferson's home at Monticello, and John Adams at his home in Braintree, Massachusetts. Along every leg of Lafayette's journey, and at every stop, he was hailed by adoring Americans of all ages, from young children to old Revolutionary War veterans who gathered in ever dwindling numbers. Throughout the country, chapters of the Society of the Cincinnati, founded in 1783 by officers of the Continental Army and their French counterparts who fought in the American Revolution, organized rallies and processions for Lafayette, one of the last surviving generals of the American Revolution. 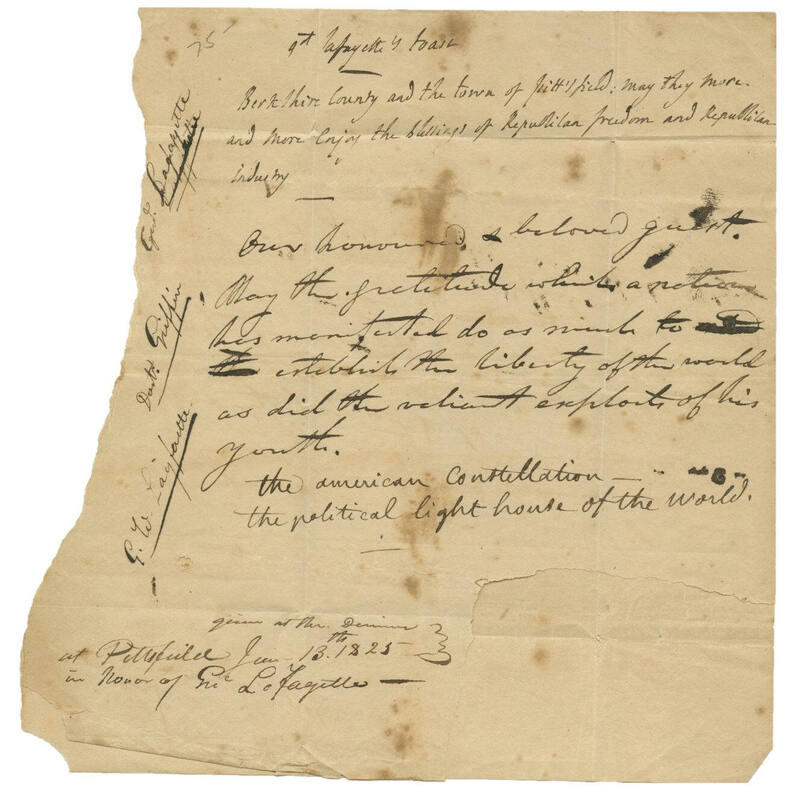 A printed note accompanying this 13 star American flag reads, "this flag used in the Battle of Saratoga September, October 1777 accompanied General Lafayette 13 June, 1825 from Albany to the Massachusetts state line". The other document is a series of three toasts, the first in Lafayette's own hand, the second in the hand of Rev. Dr. Edward Dorr Griffith, President of Williams College, and the third in the hand of Lafayette's son, George Washington Lafayette, along with an annotation that reads, "given at the dinner at Pittsfield June 13th 1825 in honor of Gen Lafayette". Astonishingly, the flag and the toasts were found in different places and acquired from different people at different times; yet both relics have survived as a cherished mementos of the same event, on the same day, nearly 200 years ago. Although he visited New York and New England in the early part of his trip, Lafayette was again asked to return north prior to his departure home to France in 1825. A new monument was planned at Bunker Hill in Boston and the citizens of Boston invited Lafayette to lay the cornerstone. Lafayette returned to New York State in June, 1825, and by mid-June, Lafayette had made his way to Albany, New York. The story of the flag and the toasts begins early in the morning of June 13, 1825. According to records about General Lafayette's trip that day, the General and his traveling party left Albany on horseback at 6:00 a.m. and arrived in Lebanon Springs (now New Lebanon, NY) at 2:30 p.m.1 The guestbook for the Columbia Hall hotel in Lebanon Springs for that day describes the arrival of the delegation accompanying Lafayette. June 13, 1825, Marquis de Lafayette and son, Gen. Solomon Van Rensselaer, Col. Clinton, Capt. Spencer and lady and two children, Mr. Norton, wife, and two children; Col. Bloodgood, Major J.B. Van Schaick, Col. John T. Cooper, Major P. Seaton Henry, Major R. V. De Witt, Lieut. Col. Knowlson, Major T. A. Bridger, Surrogate; Capt. S. V. R. Bleecker, Capt. Osborn, Capt. Hendrickson, Lieut. Webster, Lieut. Volkenbrugh Shaukland, Adjt. Hazard, Adjt. Brush, James Eryhts, Surgeon S. G. Infantry. General Lafayette was welcomed to the county, and the commonwealth, by Sheriff Brown, and after acknowledgments made with his usual grace and courtesy, he took his seat in an elegant coach…richly festooned with flowers, and drawn by four spirited grays, bore him pleasantly and rapidly to the village of Pittsfield. The approach of the cavalcade to the village was announced by bells and cannon, and thousands of citizens from all parts of Berkshire assembled in the park, and neighboring streets, to greet the expected guest, who, at a little before six o'clock, alighted from his carriage, at the door of Captain Herrick's coffee-house, and the most enthusiastic cheers of the multitude. On the green, between the church and the Old Elm, a beautiful triumphal arch had been erected; bearing in the center of the front the salutation, 'Welcome Lafayette', and on the sides, the names of the American battlefields upon which he had most distinguished himself. Above the arch hung a well-proportioned national flag, forty-seven feet long, which the ladies of the village had made that morning, and which had been suspended…from the top of the Old Elm, where, in the favoring breeze of the day, it floated with imposing effect. General Lafayette, accompanied by the committee, passed between two columns of citizens and soldiery, to the arch, under which he was addressed by Hon. Jonathan Allen, in a few comprehensive and striking remarks; to which he replied with much feeling, expressing his reciprocation of their affection, and a deep sense of the unequaled honor bestowed upon him. He then proceeded through two lines of school-children to the church, where he was addressed by Professor Batchelder, of the Medical College, in behalf of the ladies of Berkshire, who filled the house to overflowing…He was here also introduced to many of the clergy and to a number of Revolutionary veterans, several of whom had been his companions in arms. He then returned to the coffee-house, escorted by the Berkshire Grays - a favorite military company…the citizens crowding upon the procession, anxious to behold, and, all who could, to touch the hem of his garment; among them some of the leaders of the Shakers, who, contrary to their custom, approached the august personage with their hats in hand. At the hotel, a sumptuous dinner had been prepared; the hall and tables being decorated with evergreens and flowers, mingled with paintings and standards, some of great elegance, which attracted the particular notice of the general and suite, and the admiration of all. A blessing was invoked by Rev. Dr. Griffin, president of Williams College, in his usual exalted style; and the closing benediction was made by Rev. Mr. Bailey, in a very appropriate and elegant manner, with a solemn allusion to the recent catastrophe on the Ohio. A number of toasts were given; among them, the following by Colonel Danforth: "Our beloved guest. General La Fayette; the companion in arms of Washington, Greene, Gates and other brave officers of the revolutionary army." The General responded with the following sentiment: "The citizens of Berkshire, and the people of Pittsfield — may they continue to enjoy, more and more, the benefits of their industry, and the fruits of their republican institutions." These toasts are written by the men in their own hand, with Lafayette, also writing "1st. Lafayette's Toast" above his own. The toast originally surfaced at auction in 2012. It was acquired by the Raab Collection, a renowned authority and foremost dealer in rare autographs and ephemera. According to Steven and Nathan Raab, "this toast is the only signed toast of a significant 18th or 19th-century notable we can recall seeing, nor has our research turned up any others. Since toasts were ephemeral, and many were not even written down, its survival is extraordinary. Manuscript mementos from Lafayette's epochal tour of America are rare, and important ones extremely so. This is the first we have had." Likewise, the flag is exceptionally rare and important. There are very few American flags that survive from the earliest era of American flag, generally considered those made prior to 1830. I am not aware of any, in literature or in institutional or private documented collections, that have documentation directly linking them to Lafayette's visit. The family in which this flag descended has direct documented ancestors from Albany, NY who fought in the Revolution, and the very specific reference to the precise date of Lafayette's trip from Albany to Massachusetts is excellent evidence that it was written by a person with first hand knowledge of the event and the flag's role in it. The flag does not date to the 1777 Battle of Saratoga, and in fact it's unlikely that any flags in the stars and stripes format were fielded during that battle, which occurred just months after the First Flag Act describing the American flag was passed. However its construction is consistent with flag-making of the period from 1800 to 1825. 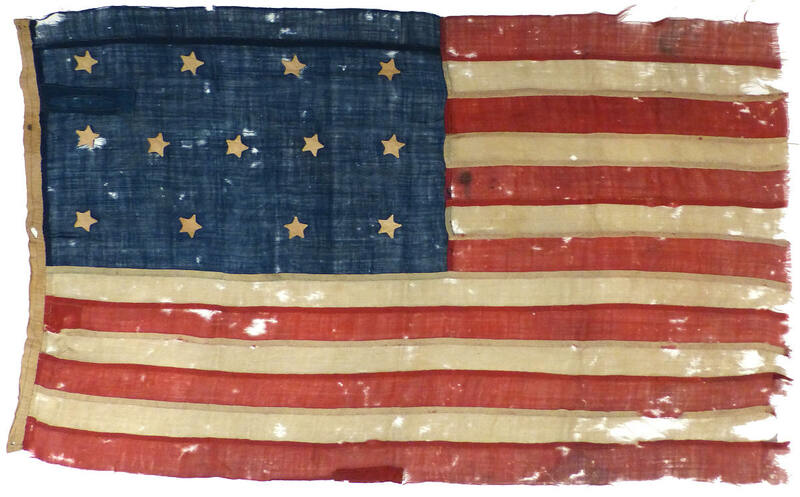 Based on written records, many 13 star flags were made and carried specifically to honor Lafayette and the Spirit of 1776 during his visit, though almost none survive today. Also of note is the extraordinarily poignant tie between these two ephemeral objects that is found in the beautiful words chosen by George Washington Lafayette for his toast. He toasts "the American Constellation", a direct reference to the symbolism of the stars of the American flag, derived from the language of the First Flag Act of 1777: "Resolved, That the flag of the thirteen United States be thirteen stripes, alternate red and white; that the union be thirteen stars, white in a blue field, representing a new constellation," passed on June 14, 1777, the day after his father first set foot on American soil. He could not have imagined that his words from that day would be preserved for posterity and one day be reunited with an American flag that actually traveled with him and his illustrious father on that very same day. 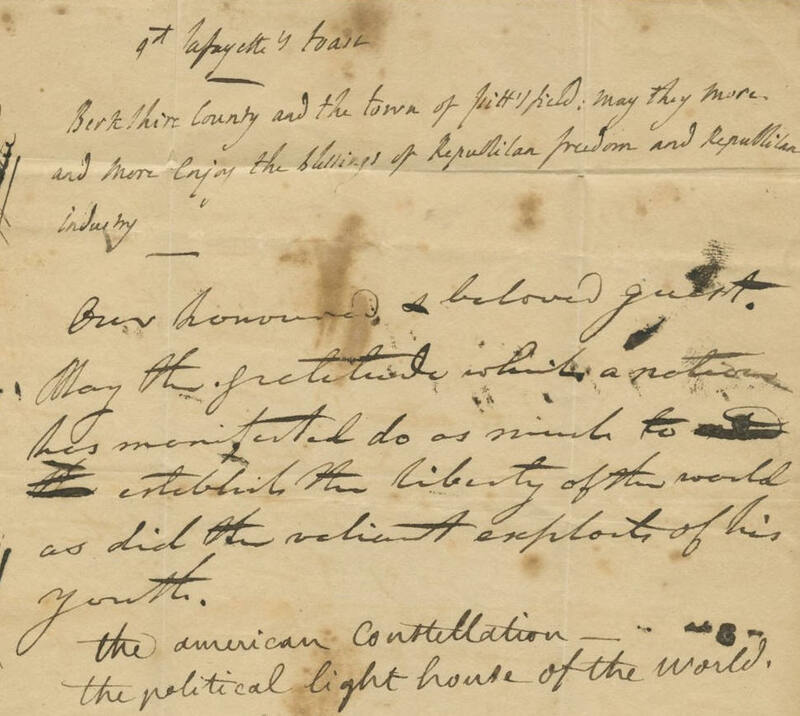 It is impossible to overstate the rarity of this American flag and these hand written toasts, both witness to the same moment in Lafayette's visit to America, miraculously brought together again after nearly two centuries apart. 2 A HOTEL WITH A HISTORY. ; Columbia Hall, at Lebanon Springs, Has Seen Some Noted Guests, New York Times, August 5, 1894. Learn more about Thirteen Star American Flags.